Blade length : 69.6 cm or 27.40 inches. Weight of only blade: around 690grams. Weight of blade and Tsuka and Tsuba (without Saya): around 1050 grams. Shape : Regular size Katana and long Kissaki. nice shape Katana. Jitetsu : Ko-Itame Hada well grained with Jinie attach. It is clear, like Muji Jigane. Hamon : Nioi Deki, Sanbonsugi. Boshi is Midarekomi shape. Special feature : There is a signature "Noshu Seki Ju Tashiro Genichi Kanemoto" . And Hamon is Sanbon Sugi. At a glance, the signature looks genuine. But the signature is different from Tashiro Genichi Kanemot. We do not guarantee this signature. But the Jigane is nice and also balance is nice. 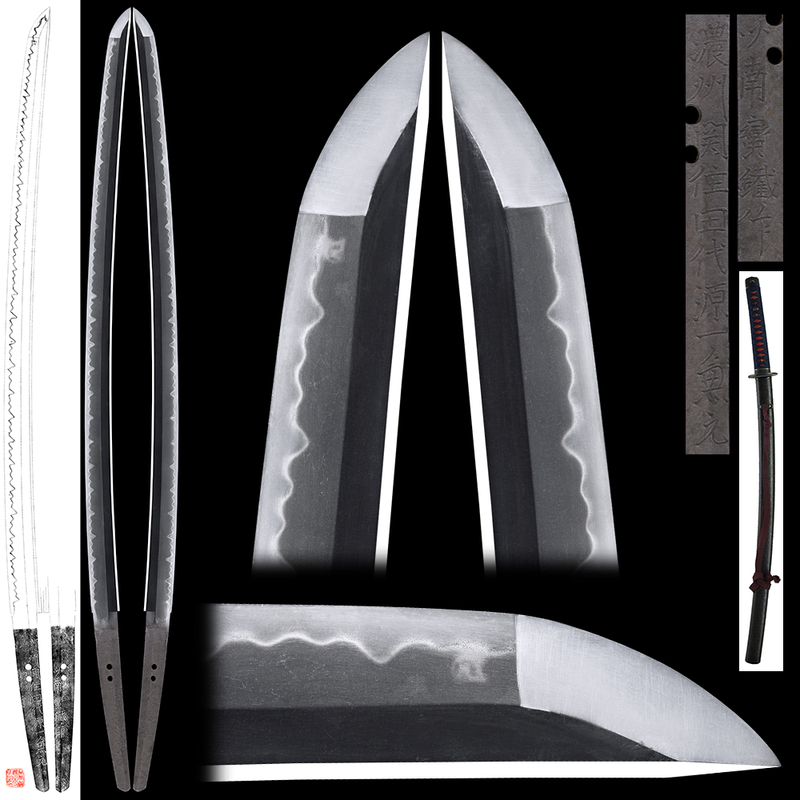 We recommend this sword for Iai and also appreciation. Tsuba : Round shape, iron Tsuba with Kabuto design. Fuchikashira : Shakudo Ishime-Ji Saya with Kizasmi. Saya : Aogai Chirashi(blue shell) Kawari Nuri Saya. Menuki : Copper, Kabuto and arrow is engarved. Katana:(Unsigned) attributed as Kouda school.